Yesterday afternoon, my friend Kathy took me on a Secret London walk. 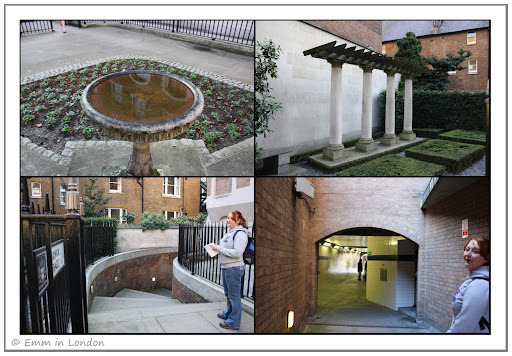 There is so much to see in London and so many hidden passages, statues, gardens and other interesting places and it was fascinating to just see one tiny part of secret London. Kathy has a copy of Andrew Duncan’s fabulous book Secret London: Exploring the Hidden City, with Original Walks and Unusual Places to Visit and we used this as our guide. 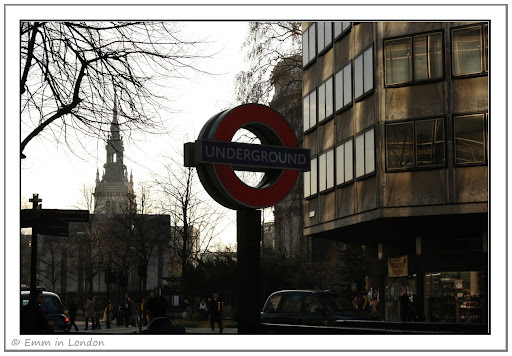 We started off at St Paul’s Underground Station. Our first stop was Postman’s Park, named after Rowland Hill, the man who campaigned tirelessly to introduce postal reform in the United Kingdom. He is credited with introducing penny postage. 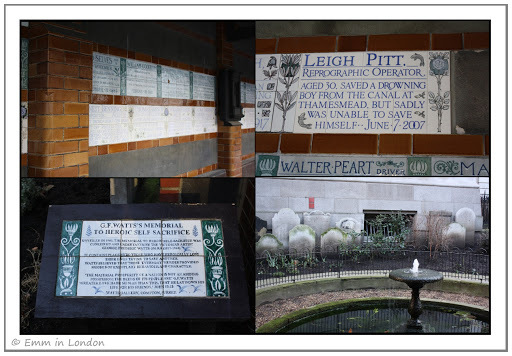 Postman’s Park is home to the incredible Heroes’ Memorial which is a memorial to ordinary men, women and children who gave their lives to save others. 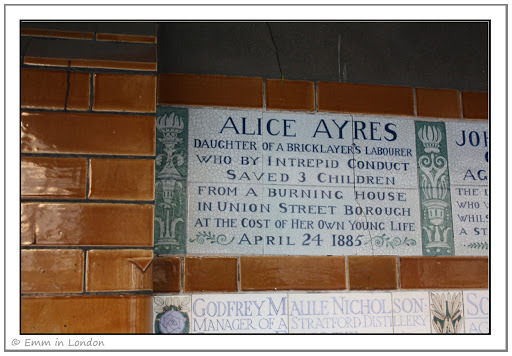 It was built by G. F. Watts who was inspired by the story of Alice Ayres, a 26-year-old maid who died saving her employer’s children from a fire. Kathy told me that “Alice Ayres” was the primary alias used by the character played by Natalie Portman in the film Closer. Just outside of Postman’s Park is a stature of Rowland Hill, for whom the park was named. We then came upon one of the first and only parts of the walk that I had previously known, the remains of the Christ Church Greyfriars and that is quite a feat considering that I had taken part in the Race for Life in this area on two previous occasions. When I last saw the church in June 2010, it had scaffolding up and didn’t look so pretty. It looks better now but still looks better in summer when all of the trees grow in the middle. 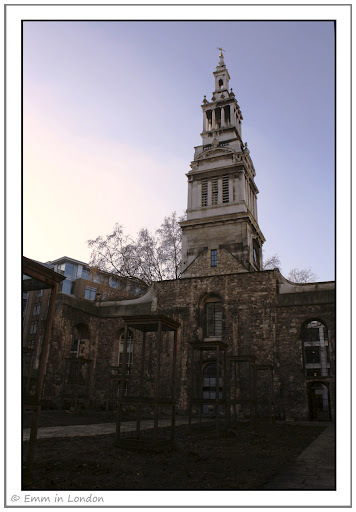 Christ Church Greyfriars was designed by Sir Christopher Wren and rebuilt after the Great Fire of London, only to fall victim to the Blitz on 29 December 1940. We then turned the corner into Warwick Lane to see Cutler’s Hall. 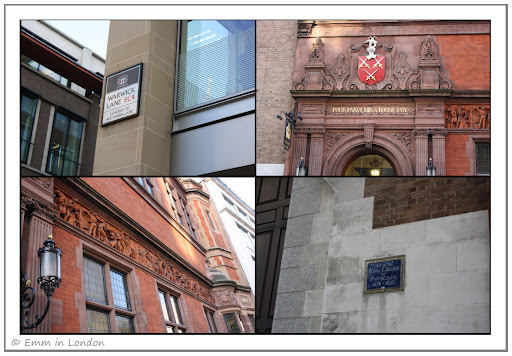 The Cutler’s Company are renowned as famous makers of knives and forks and we were most amused to see the purple plaque marking the site of the Royal College of Physicians next door. The terracotta frieze above shows craftsmen forging metal. We crossed Warwick Square which was site of the home of the Earls of Warwick in the 15th Century. I visited Warwick Castle back in 2008, so it was nice to see where they had lived in London. 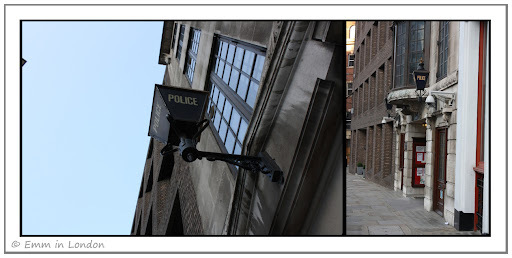 We crossed Warwick Square and went into Warwick Passage which takes you under the Old Bailey! That was quite intriguing and we walked past the entrance to the viewing gallery. It was very full though with a line of people trying to get in, so we carried on walking. That is Kathy, my tour guide. She is made of awesome cakes. 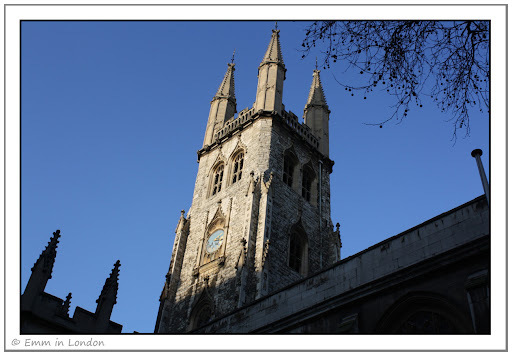 Across the road from the Old Bailey is St Sepulchre’s Church. The Newgate Prison used to stand at the site of the Old Bailey and a bellman from St Sepulchre’s Church used to ring a hand bell on execution nights and appeal to the condemned to make their piece with God. 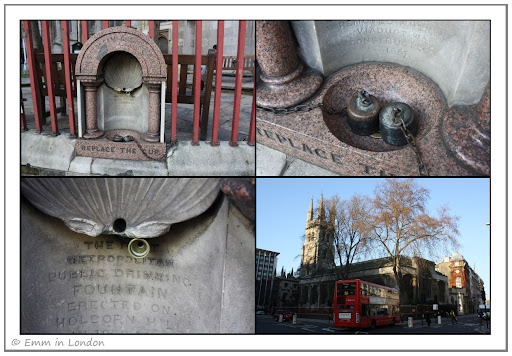 The church is also the site of the first drinking fountain installed in London. It was meant to discourage the use of alcohol and was the only source of sterile drink for many people. We walked past the church and turned the corner to see the tiniest police station I had ever seen. That wasn’t the least of the excitement regarding this site though! 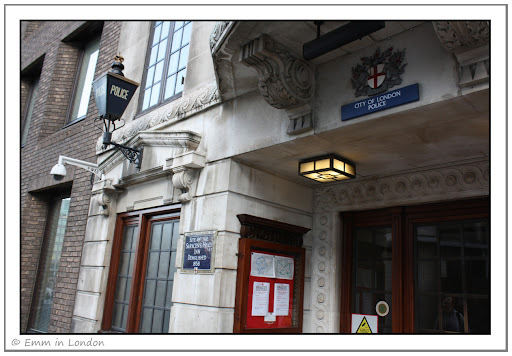 The Snow Hill Police Station is located at the site of the Old Saracen’s Head Inn where Wackford Squeers met the Charles Dickens character Nicholas Nickleby. 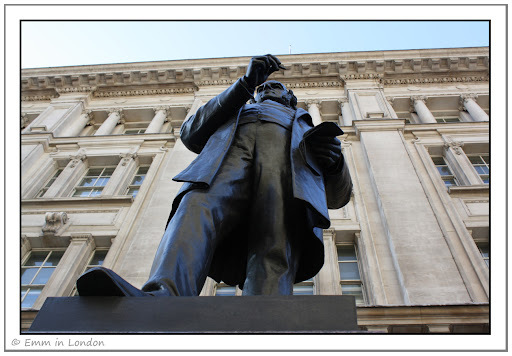 Long-time followers of this blog will know that I am quite fascinated by places related to Charles Dickens as the area where I work is steeped in Dickens’ personal history and is full of places mentioned in his novels. The next part of the walk was interesting because of its depiction of ruin and decay in London and I think it deserves a post all of its own. I am sure you are a bit weary by now anyway, as was I after all of that exercise! What a wonderful walk! Wish I could have joined you. I must have walked around some of that area one afternoon late in my London stay because I found the Greyfriars Church. I will have to put that "Secret Walks" book on my list of things to bring next time I go to London so that next time I'll know what to look for and the story behind what I'm seeing. 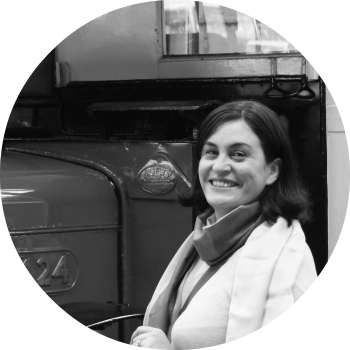 Thanks so much for detailing all of these interesting London tidbits! What a coincidence, I have a copy of Andrew Duncan's book sitting in front of me. It has indeed got a few interesting walks and places to visit. Postman's Parks is well worth visiting (it was used as a location in Closer), as is the William Wallace plaque which is just a stones throw away, and there is also a great little old pub the Rising Sun nearby that sells ridiculously cheap booze. Walking around London for hours is such fun...I never feel tired until I get home and put my feet up! You crammed some pretty impressive sites into one walk. I suppose that is the beauty of being in a huge city with an ancient centre - you don't have to walk 120 ks to see it all. But I expected "secret" to mean hidden away because of illegality or nastiness. Not at all.. the places you visited are gorgeous. And normal. I am particularly impressed with Cutler’s Hall and the Royal College of Physicians next door. I love old guilds, trades halls and professional unions. You know, I've been to Postman's Park before, but I never gave it a second thought. Thank you for opening my eyes! That fountain at St Sepulchre's reminds me of the Temperance Fountain at 7th and Pennsylvania in Washington DC which was also put there to discourage alcohol consumption. Great stuff Emm. I so enjoy getting off the beaten track and discovering previously unseen stuff. Even here I try to do this stepping outside of the normal tourist routes. It all sounds good but I was particularly taken by Postman's Park, somewhere I have never heard of or seen. Your guide was made of awesome cakes??? Come again??? @ Kathy: You would have loved it and I certainly recommend that book! It was amazing to walk around places I kind of knew but to see things and learn things that I had never seen before. @ William: Oh no! I didn't see the William Wallace plaque or the Rising Sun pub. Now I see why Kathy has completed the walk three times. @ Hels: Ha! Naaah, I'm a bit of a coward and tend to shy away from the seedier side of life (not so in my 20s!). The guide book is amazing. We saw so much in just about 2 miles! @ Richard: Hi! And it is a pleasure. First they introduce gin to keep the masses in a drunken stupor and then thye tried to reduce drinking! @ Mike: You and I are of like minds! My friend from South Africa wants to visit Thailand and I pointed her to your itinerary! @ Ash: Aaaah, I hope you make it back here one day. I will gladly take you on a walk. Awesome cakes is a secret recipe I use to cook up new friends. @ Alan: Thank you! Maybe one day we can go on a clock photo walk!? Lots to see on your walk. I think many people walk past them everyday without knowing about their historical significance. Those amazing sites and landmarks (which I see only on TV or net till now) and also the stories about the streets in London are the reasons why I got my London calling. Surprisingly, I have been to Postman's Park before too. We were just walking through the back streets with a friend who was visiting from Australia and stumbled into the park. what a lovely walk. your photos make me miss London so much. thanks for the snippets. So many great pictures! I like the staute very much, nice angle! @ AVCr8teur: That is especially true in London! There is so much history in this town and it goes back thousands of years! @ Con Artist Trickster: Your comment made me think and I have to concur. I think I have a London calling too and it would be hard to live anywhere else. 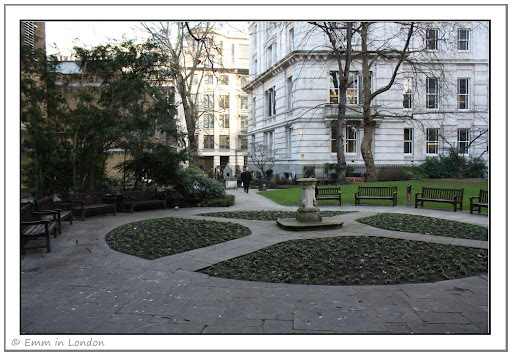 @ DelBoy: St Dunstan's is right up there on my list of places I HAVE to visit in London this year!!! Stunning photo. @ Lily: And well you should. What are you waiting for? @ Life Ramblings: It is only a pleasure. @ Spiderdama: Thank you! I quite liked that shot myself. Hi, Emm -- I left you a "blog of substance" award over at FatScribe. I know you've got a ton, but one more wont hurt to at least pop on in to pick-up and see your fellow recipients! hope all is well in London!